I have been reading Walter Isaacson’s biography of Einstein (Simon and Schuster, 2007). I picked the book up because I wanted to learn more about Einstein’s contribution to physics and what is really at stake with the special and general theories of relativity. I also wanted to learn about his life – what it was like to live in as a Jew in many antisemitic pockets of Europe in his earlier years, how he balanced his brilliance and his later academic fame with his personal life, what set him apart as a truly great thinker, and so on. Its a very well-written biography and has been worth the time spent on it. What I judge to be the book’s greatest strength is that Isaacson makes Einstein intelligible to non-scientists without watering him down. 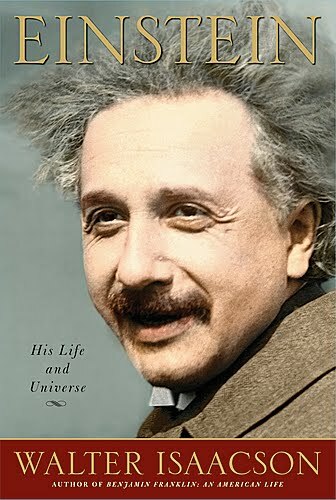 My overall impression of Einstein from this book was the sense that what drove him and made him such a great scientist was his curiosity, his sense of wonder and reverence before the immensity of the universe, his imagination, his passion, his willingness to question both authority and the mundane, his intuition, his willingness to dream. How opposite to some rationalistic stereotypes of science! Einstein relied upon “thought experiments” to arrive at his most famous ideas, guided by an intuitive sense that the structure of reality must harmonious, beautiful, and simple. He claimed that his inspiration for science was the same as the poet’s inspiration – “a sudden illumination, almost a rapture” (549). Einstein shows that scientific inquiry is anything but detached, objective observation of the world: it has a non-linear, imaginative side to it. “Imagination is more important than knowledge. Knowledge is limited. Imagination encircles the world” (387). “When I am judging a theory, I ask myself whether, if I were God, I would have arranged the world in such a way” (551). “I have no special talents, I am only passionately curious” (548). Other aspects of Einstein’s personality that will stay with me from this book include his extreme absentmindedness (which was truly hilarious at times! ), his rebelliousness and loner mentality, his non-conformism, his sense of humor, his pacifism, his socialism, his Zionism, his determinism, his love of music, his social conscience, and his sheer gusto. He truly would have been fascinating to sit down and have a conversation with! “A spirit is manifest in the laws of the Universe – a spirit vastly superior to that of man, and one in the face of which we with our modest powers must feel humble” (388). “Human beings, vegetables, or cosmic dust, we all dance to a mysterious tune intoned in the distance by an invisible player” (392). “Try and penetrate with our limited means the secrets of nature and you will find that, behind all the discernible laws and connections, there remains something subtle, intangible, and inexplicable” (384). You could perhaps call Einstein a deist flirting with theism (note: not a deist flirting with Christianity). What is very clear is that Einstein has nothing of the “science has disproved God” mentality that is so common among many contemporary scientists. On the contrary, the more he became acquainted with the laws of the universe, the more he suspected Something beyond the universe, animating these laws and breathing life into them. You could say that his passionate study of this world gave him the eerie feeling of another world behind it. While he certainly rejected the idea of a personal God as this ulterior force, he did not do so on scientific grounds. Einstein: “I’m not an atheist. The problem involved is too vast for our limited minds. We are in the position of a little child entering a huge library filled with books in many languages. The child knows someone must have written those books. It does not know how. It does not understand the languages in which they are written. The child dimly suspects a mysterious order in the arrangement of the books but doesn’t know what it is. That, it seems to me, its the attitude of even the most intelligent human being toward God” (386). I think the metaphor Einstein gives about the child in the library is a very understandable position within the categories of common grace and general revelation. The proper Christian response to this is not to deny the complexity and vastness of the question of God in relation to human minds. The metaphor is indeed appropriate, given God’s immensity and our frailty. The Christian, however, believes that the metaphor does not end there, but ends with the Librarian showing up, walking over to the child, and explaining to him what the books mean. “No one has ever seen God; the only God, who is at the Father’s side, he has made him known” (John 1:18). Reading this book made me a better theologian. I think above all else it reminds me of how inescapable the Reality of God is. His beauty and glory are all over creation, and they press in on us from all sides, whispering at us of the world beyond this world. As Einstein himself put it: The child knows someone must have written those books. great post! I love you and am proud of you. You are much more of a nerd than I anticipated. However, this is cool stuff. Garrett, my nerdiness has depths to which you have never plummeted. That child in the library idea contrasts so much with someone like Richard Dawkins. I love it that Einstein was so humble.